A pit-house (or pithouse) is a building that is partly dug into the ground, and covered by a roof. Besides providing shelter from extremes of weather, these structures may also be used to store food (just like a pantry, a larder, or a root cellar) and for cultural activities like the telling of stories, dancing, singing and celebrations. General dictionaries also describe a pit-house as a dugout, and it has similarities to a half-dugout. In archaeology, a pit-house is frequently called a sunken featured building and occasionally (grub-)hut or grubhouse, after the German name Grubenhaus They are found in numerous cultures around the world, including the people of the American Southwest, the ancestral Pueblo, the ancient Fremont and Mogollon cultures, the Cherokee, the Inuit, the people of the Plateau, and archaic residents of Wyoming (Smith 2003) in North America; Archaic residents of the Lake Titicaca Basin (Craig 2005) in South America; Anglo-Saxons in Europe; and the Jōmon people in Japan. 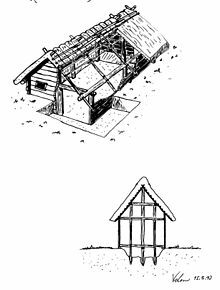 Anglo-Saxon pit-houses may have actually represented buildings for other functions than just dwellings. Usually, all that remains of the ancient pit-house is a dug-out hollow in the ground and any postholes used to support the roof. In the nineteenth century, it was believed that most prehistoric peoples lived in pit-houses, although it has since been proved that many of the features thought of as houses were in fact food prehistoric storage pits or served another purpose. The oldest pit dwellings were discovered in Mezhyrich, Central Ukraine. Dating back 15,000 years to the Upper Paleolithic age, the houses were made of mammoth bones. 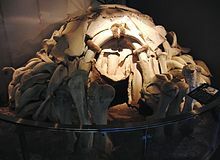 The base is circular or oval in shape, 12 to 14 feet (3.7 to 4.3 metres) in diameter, with limb bones used for walls and lighter, flat bones used for the roof. Presumably, animal hide was stretched around the exterior for insulation. Each dwelling had a hearth. Groups of houses were arranged around a base camp layout, occupied by families or relatives for weeks or months. Pit-houses were built in many parts of northern Europe between the 5th and 12th centuries AD. In Germany they are known as Grubenhäuser, and in the United Kingdom, they are also known as grubhuts, grubhouses or sunken featured buildings. Archaeological evidence indicates they were built in a shallow sub-rectangular pit and vary in depth (often relating to the preservation of the site). Some may measure 0.25m by around 2m by 1.5m, whilst examples from excavations from the 1950s onwards at West Stow in the United Kingdom are 3.7m-4.44m long x 2.72m-3.5m wide x 0.58m-0.97m deep. Within this pit were placed two (but sometimes 0, 4, or 6) substantial wooden posts in postholes at either end of the long axis. Some archaeologists have suggested that a suspended wooden floor lay over the pit and that the cavity beneath was used for storage or to control dampness, although others have disputed this, suggesting that grubenhäuser did not have suspended floors at all. A gabled roof supported by the timber posts covered the hut, which likely had no windows and had a single entrance at one end. Excavations at West Stow (UK) in the 1970s found preserved evidence of charred planks, suggestive of suspended floors. Hearths were also found, which sat partially over the edge of the sunken pits and appeared to have collapsed downwards when the structure supporting their overhanging sections (possibly a suspended floor) was removed and that a bivouac style roof would not be practical. Grubenhäuser are often understood to have been domestic dwellings. However, their use may have varied, especially on a regional basis. In Western Europe their small size and the fact that they can be found near other buildings and associated finds of loom weights has led to theories that they had a specialised purpose such as for weaving sheds. In the Slavonic regions of Eastern Europe, Grubenhäuser are larger and often have a fireplace. In most settlements there have been no features of buildings at ground level. There are reconstructions of pit-houses in several open-air museums, e.g. in the Hitzacker Archaeological Centre, the Kalkriese Museum and Park, the Oerlinghausen Archaeological Open Air Museum, and the Hochdorf Chieftain's Grave. Throughout the inland Pacific Northwest, indigenous people were nomadic during the summer and gathered resources at different spots according to the season and tradition, but over wintered in permanent semi-subterranean pit houses at lower elevations. The winter was often the only time families saw others- even if they were from the same village and tribe- and congregated in any numbers before the arrival of trading posts. Often these houses were located along on major rivers and tributaries like the Columbia and Fraser; were typically round and fairly small, and were covered in layers of tule mats to keep out the weather and keep in the heat. There was a smoke hole in the center, and the interior, though warm in winter, was exceptionally smoky. These are pit-house replicas in the Pueblo Grande Ruins in Phoenix, Arizona. They represent what the Hohokam pit-houses looked like 1000 years ago. In the northwestern Great Plains and the Plateau region located nearby, climate changes and extreme temperature and weather conditions made it difficult to live year-round. Hot summers led to the building of simple tent like structures that were portable and could be packed up to move. For cold winter months, pit-houses provided the warm, protected shelter necessary for survival. Barn on a wooden cellar in Gluringen, Valais, Switzerland. Traces in the ground would appear as a "pit-house". A cross-cultural middle range model[clarification needed] of pit-house architecture using the Ethnographic Atlas[clarification needed] found that 82 of the 862 societies in the sample occupy pit structures as either their primary or secondary dwellings. All but six of the 82 societies live above 32° north latitude, and four of the six cases in this sample that are below 32° north latitude are from "high mountain" regions in east Africa, Paraguay, and eastern Brazil. The last example is from the Yami who occupied a small island south of Formosa. Three conditions were always present among groups in the sample: 1) non-tropical climate during the season of pit structure habitation; 2) minimally a biseasonal settlement pattern; 3) reliance on stored food during the period of pit structure occupation. These conditions may be related to other factors of society and the presence of any or all of these three elements in society does not pre-condition occupation of pit structures. Nonetheless, these three conditions were present in all cases of pit structure occupation present in the Ethnographic Atlas. Other cultural patterns were common, but not universal across the sample. These commonalities include: cold season of occupation, low population estimates, and simple political and economic systems. The ethnographic sample is based almost entirely on case studies from societies located in northern latitudes. The period of pit structure occupation is generally during the cold season, probably due to their thermal efficiency. Dug into the ground, pit structures take advantage to the insulating properties of soil, as well as having a low profile, protecting them from exposure to wind-induced heat loss. Since less heat is lost by transmission than is in above ground structures, less energy is required to maintain stable temperatures inside the structure. Out of the 82 ethnographic cases in the Ethnographic Atlas, 50 societies had population estimates. Of these, 64% had fewer than 100 people per settlement. In only 6% of cases were there more than 400 persons per settlement. The cases with the highest population densities were the Arikara and Hidatsa of the North American Great Plains and the Konso of Ethiopia. Gilman attributes high population densities among the Arikara to the availability of buffalo. Pit structure occupations are generally associated with simple political and economic systems. For 86% of the sample, class stratification or social distinctions based on non-hereditary wealth were reported as absent. However, some pit-dwelling societies are characterized by chiefdom level complexity. In terms of economic organization, 77% of the societies who occupy pit structures had a hunting and gathering economy. This is a large fraction of the sample, but is not considered a universally consistent feature like biseasonal settlement and a reliance on stored foods during pit structure occupation. During the part of the year when people are not living in pit structures, activities should be focused on acquiring foods to store. Based on the sample from the Ethnographic Atlas, this may be through either hunting and gathering or agricultural activity. Many different prehistoric groups used pit houses. Although generally associated with the American southwest cultures, such as Fremont, Pueblo, Anasazi, Hohokam, and Mogollon, pit houses were used by a wide variety of people in a wide variety of places over the past 12,000 years. 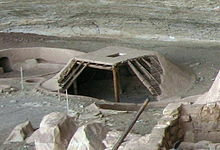 Large pit house formations have been excavated in British Columbia, Canada, such as at Keatley Creek Archaeological Site. First, all loose dirt is scraped off the pit-house surface, using trowels. A construction number (C_) and a feature number (A_) are assigned, and bird's-eye view photos are taken of the surface of the pit-house. A ~30 cm wide section of the pit-house is cordoned off using string and nails in an east–west orientation, as is typical. This profile wall is left intact for the bulk of the excavation so a team can clearly see the separate layers of the pit-house as they dig deeper. Trowels are then used to excavate on either side of the profile wall. While some finds turn up directly through digging, others are found once the removed soil is sieved. A scaled diagram (either 1:10 cm, 1:20 cm, or 1:50 cm) of the pit-house is drawn afterwards to document the location of important finds. Once the floor layer is reached, aerial pictures are taken once again. The profile wall is then excavated to reveal the full pit-house floor. Along the way, all important finds are bagged and assigned artifact (X_) numbers. While many standard definitions of pit-houses tend to render them as 'primitive' or 'pre-modern' structures, they remain examples – along with rammed earth and straw-bale building – of elegant and sustainable architecture and design technologies that work with the existing ecological and environmental features of a given space or site. In Canada, pit houses are emblematic of local indigenous knowledge and practices, which build with as opposed to against the land. One current and symbolic example is the pit-house recently erected at the Unis’tot’en Camp, an autonomous community located on the proposed North Gateway Pipeline route across the traditional territory of the Wet'suwet'en people (central British Columbia). Built by members of the band along with activists and allies who live in solidarity in the camp, the house is an expression of sustainable building alternatives. ^ Harris, C. M. (1998). "Dugout". American architecture: An illustrated encyclopedia (p. 104). New York: W.W. Norton. ^ Whitney, W. D. (1889). "Dugout" def. 2. The Century dictionary: An encyclopedic lexicon of the English language (Vol. 3, p. 1793). New York: The Century Co.
^ G.L. Brook Symposium, C., & Kay, C. (2000). Lexicology, semantics, and lexicography: Selected papers from the fourth G.L. Brook Symposium, Manchester, August 1998. Amsterdam: J. Benjamins. ^ Snow, Dean (2010). Archaeology of Native North America. Upper Saddle River, NJ: Prentice Hall. p. 261. ISBN 013615686X. ^ a b c d e f g h Trier, T. "2014: Archaeological Excavation Report for FHM 5216 Tønnesminde, Brundby By, Tranebjerg sogn, Samsø herred, tidl". Moesgaard Museum. Sb.nr. 138 (Sted nr. 03.05.05). ^ Brown, Nancy Marie. "Secrets of Ancient Iceland, Dispatch 1: Digging into the Viking Age". Penn State News. Penn State University. ^ Vésteinsson, Orri. "Icelandic farmhouse excavations. Field methods and site choices" (PDF). University of Oslo. University of Oslo Press.